The city of Boston is one of the most visited destinations in the country and with good reason. Millions of people come each year to experience the rich heritage that comes alive on practically every corner, the abundance of cultural attractions, entertaining venues and diverse dining scene. If you only have one day to explore Boston, jump on the Old Town Trolley and follow these recommended stops to see the best of the city. Three of the city’s most historic sites are right here and can be toured in about an hour and a half to two hours. You’ll be able to see Paul Revere’s House, the Old North Church and Copp’s Hill Burying Ground all in one stop. Discover the fascinating maritime past of Boston and see some of the world’s most amazing ships and vessels. 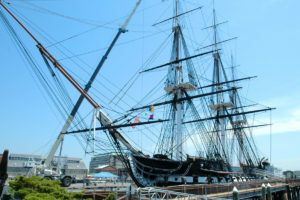 The USS Constitution, originally launched in 1797, is the oldest commissioned warship still afloat and resides in the Boston Navy Yard. Give yourself about an hour to walk the decks and tour the museum and see all it has to offer. After, allow about a half an hour to see the USS Cassin Young, named after soldier and Medal of Honor Award recipient, Cassin Young. Also residing in the Boston Navy Yard, this ship was first launched in 1943. The Bunker Hill Monument is also here and you’ll want to give yourself a half an hour to view a stirring tribute to this major battle of the American Revolution. See the Old State House, the Boston Massacre Site, the Old South Meeting House and King’s Chapel Burying Ground. All of these are stops on the Freedom Trail, but by riding the Old Town Trolley, you’ll have more time to learn about each of these sites and their importance to American History. To thoroughly enjoy all of these sites, allow yourself about an hour and a half. Here you’ll find a multitude of great restaurants, upscale shopping and the historical Copley Square, named after the American Portraitist John Singleton Copley. Enjoy the lovely 19th century architecture and the bronze statue of Copley at the north side of the square. See some of the most photographed spots in the city within the historic Beacon Hill neighborhood. This area is known for its historic houses and makes a fun stroll for those who love beautiful architecture. You’ll also see the quaint row houses on Acorn Street, Boston Common, the oldest public park in the United States, the Charles Street Meeting House and Louisburg Square, one of Boston’s most prestigious addresses. And, if you didn’t have a chance to enjoy a meal in Copley Square, Beacon Hill offers a selection of exceptional restaurants and eateries. At this point in your day, you’ve already seen most of the sites along the Freedom Trail and many other historic points of interest in the city. When you reach Stop 14, hop off and give yourself about an hour to tour the golden-domed Massachusetts State House, the African Meeting House, which is the oldest African American Church in America, the Park Street Church and the Granary Burying Ground, which is where famed Bostonians Peter Faneuil, Sam Adams, Paul Revere, John Hancock and more are buried. Visit the Boston Tea Party Ships & Museum® and be a part of the event that changed the course of American history. End your day at Faneuil Hall and Quincy Marketplace. Historic Faneuil Hall was built in 1742 and is one of the most popular sites to see while in Boston. It was here that famous patriots made speeches against British oppression, and where Americans gathered throughout the years in support of various movements. Be sure to look up to see the gilded grasshopper weather vane and ask about its significance during the Revolutionary War. End your day of sightseeing with a stop in the Faneuil Hall Marketplace, home to more than 150 different shops, restaurants and merchant carts. Grab a bite to eat and perhaps a souvenir or two of your unforgettable visit to Beantown. There is so much to do and see in Boston that it can be overwhelming for just one day. Old Town Trolley makes it easy with this well-planned itinerary that includes a mix of attractions and historic sites to accommodate your entire group.